If you're looking to buy a home or refinance anytime in the near future you may have been happy to hear the news this past week that mortgage rates are now at the lowest levels in years. It is good news for those looking to buy, but there is a big caveat. Not everyone will be able to take advantage of the low rates because of a variety of factors. We're currently looking to do one or the other – either refinance – or if we find the right situation – buy a new home. So what is all the hub-bub? Freddie Mac announced this week that the rates for a 30 year mortgage were at their lowest level in 6 decades – down to 4.12 pecent. Fixed mortgage rates fell this week to the lowest levels in six decades. But few Americans can take advantage of the rates to refinance or buy a home. The average rate for the 30-year fixed mortgage fell to 4.12 percent, down from 4.22 percent, Freddie Mac said Thursday. It's the lowest level on records dating back to 1971. And Freddie Mac says the last time rates were cheaper was 1951, when most long-term home loans lasted just 20 or 25 years. 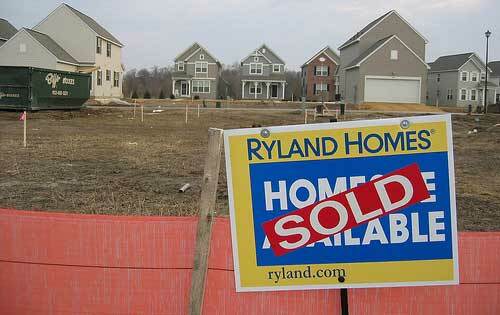 The average rate on a 15-year fixed mortgage, a popular refinancing option, fell to 3.33 percent from 3.39 percent. That's the lowest on records dating to 1991 and likely the lowest ever, according to economists. So rates are extremely low, down to the low 4 percent range. I know that's definitely lower than when we bought our home a few years ago. That's great news if you're looking to buy or get a lower mortgage payment. But even so most experts aren't expecting this news to energize the depressed home market. Mortgage rates tend to track the yield on the 10-year Treasury note, which fell to an all-time low this week. An uncertain outlook for the U.S. economy has led many investors to shift money out of stocks and into the safety of Treasurys, lowering the yield. Still, few expect record-low rates to energize the depressed home market. Over the past year, the average rate on the 30-year fixed mortgage has been below 5 percent for all but two weeks. That compares with five years ago, when the average 30-year fixed rate was near 6.5 percent. Yet prices and sales remain unhealthy and are holding back the overall economy. Sales of new homes are on pace to finish the year as the lowest on records dating back a half-century. The pace of re-sales is shaping up to be the worst in 14 years. While rates are low, the unfortunate thing for homeowners and buyers is that most can't take advantage. The reason? Either their credit isn't good enough after the last couple recessionary years, or they don't have enough of a down payment. Many Americans can't take advantage of this rare opportunity. Some are in no position to buy. Unemployment is high, few Americans are getting raises and many are struggling to shrink their debt loads. But others can't qualify for the lowest rates. Banks are insisting on credit scores above 700 and 20 percent down payments for first-time buyers. Many repeat buyers have too little equity invested in their homes to meet loan requirements. Studies have shown that about 40% of U.S. households have credit scores necessary to get a prime mortgage rate, but most people just don't have enough for a 20% down payment. In fact a huge number of folks are now in an underwater mortgage, and won't be able to move any time soon. So are you in a situation where you can take advantage of the low mortgage rates? Why or why not? I wanted to refinance, but didn’t! My mortgage balance is too low to make enough of a difference. Previous Post: Roth IRA: Emergency Fund?